its a game about trains. 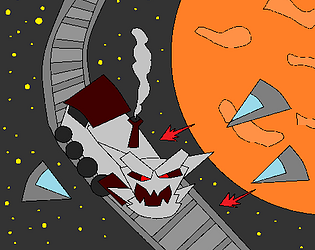 art and stuff is inspired by sinistar. my first completed game maker project. free music assets, a text to speech demo, and wilhelm's sceam. "This game is difficult, and poorly made, do not download it." lol not bad. i like the idea of track switching, i wasn't really sure what i was supposed to shoot and what i was supposed to avoid though. But good job considering 16 hours. Track switching! Nice stuff, cool idea. This game is difficult, and poorly made, do not download it.